Gustav Stickley - Als Ik Kan ~ The History Girl! Situated in the foothills of New Jersey, about forty miles west of Manhattan, noted designer Gustav Stickley set out to build a complex in the country capable of training boys in various crafts at the turn of the nineteenth century. Although his vision for a school never fully materialized, the buildings he constructed in what is now present-day Parsippany-Troy Hills retain a high level of authenticity as examples of the Arts and Craft Movement, which Stickly embraced and championed in the United States. Encompassing architecture, furniture design, and the decorative arts, the Arts and Crafts Movement prevailed between the dominant eras of Art Nouveau and Art Deco, or approximately the period from 1910 to 1925. Stickley believed in an old Flemish craftsman's phrase, Als Ik Kan, meaning "to the best of my ability." The phrase was his guiding principle in all of his ventures and his high level of craftsmanship remains in the buildings he designed over a century ago. Gustav Stickley was born Gustavus Stoeckel on March 9, 1858, in Osceola, Wisconsin. After his parents separated in 1869, Gustav left school in 1870 to work as a stonemason to help support his struggling family. By 1876, Stickley’s mother and some of his siblings moved to Brandt, Pennsylvania, where Gustav worked in his uncle’s chair factory, his first taste of furniture-making. In 1883 he and his brothers, Albert and Charles, founded the Stickley Brothers Company in Susquehanna, Pennsylvania. That same year he married Eda Ann Simmons and a year later the brothers moved their operations to Binghamton, New York. As early as 1895, Gustav traveled to Europe where he saw the English Arts and Crafts Movement and the French Art Nouveau. He liked the craftsmanship and simplicity of the designs and sought to bring these ideas to America through his furniture business. Working with architect and designer Henry Wilkinson and, later, designer LaMont A. Warner, he created his first Arts and Crafts pieces in an experimental line called “New Furniture”. The pieces were well-received as a departure from the ornamentation of the Victorian era, with simple lines and a high level of craftsmanship. 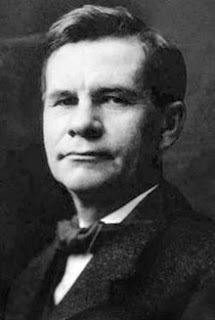 In 1898, he created the Gustave Stickley Company, of which he had sole ownership, in the Eastwood suburb of Syracuse, New York. Stickley dropped the use of the 'e' in his name in 1903. Seeking to further saturate the United States in the ideals of the Arts and Crafts movement, he published the first issue of "The Craftsman" magazine in October 1901. 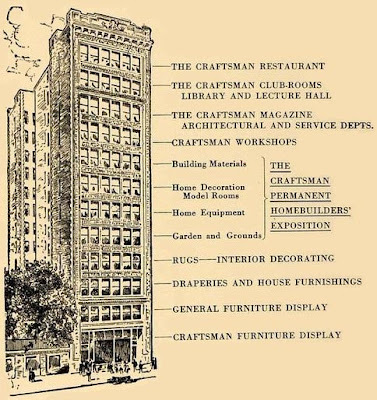 "The Craftsman" was a periodical used to promote the Arts and Crafts movement throughout the country, as well as house plans, ideas for the home and garden, Stickley's products, and writings by famous authors and essayists such as John Muir, John Ruskin and Ralph Waldo Emerson. Around 1905, Stickley moved his headquarters from Syracuse to New York City. As early as 1908, he began acquiring property on what is now the western edge of Parsippany-Troy Hills, an area formerly part of Morris Plains. He accumulated approximately 650 acres of land where he envisioned establishing a farm school for boys. Children ages six to seventeen would attend and learn from master craftsmen. The centerpiece was to be a large multi-purpose club house that would serve as a kitchen, dining hall, study hall, and central gathering space. Originally, all buildings were to be built on the southern side of his property (south side of present-day Route 10), but he later decided to build on the steeper, northern side. Beginning in July 1909 two, two-bedroom workers' cottages were constructed on the grounds, not far from where the main club house would be built. These cottages, finished by March 1910, featured red-tinted poured cement as flooring for the porches, large indoor fireplaces with copper hoods, built-in cabinetry, cypress shingles and local stone on the exterior, and a full row of glass windows across the front, allowing for natural light to filter in. Eda Stickley and their six children, Barbara, Mildred, Hazel, Marion, Gustav Jr., and Ruth would join Gustav at Craftsman Farms in the spring of 1910. Stickley wrote that his family lived in one of the cottages while the main house was under construction. The dining room in Gustav Stickley's 1911 Log House. Construction of the main building, which would become Stickley's residence, began in August 1910. Sometime during its construction, it is believed that Stickley came to the realization that he could not afford his ideal house nor support a school of the magnitude that he originally imagined. He redesigned the second floor of the club house to include four bedrooms and three bathrooms. The first floor was altered by making the living room wider and adding a large kitchen wing to the rear, transforming the building to include a rear ell. He proceeded with massive stone fireplaces at both ends of the living room, and a third fireplace was added to the dining room where the kitchen addition joined the house. Altering his original plans, the staircase to the second floor was shifted from a corner of the living room to the center of the wall between that room and the dining hall. Construction of the main building concluded in 1911. The primary main block of the house that Stickley built is one-and-one-half stories. Long shed dormers at the front and back sides of the house provide light and ventilation to the second story bedrooms. The wood used to construct the first floor of the log cabin are round logs of American chestnut with hewn sides laid together. These trees were felled from the property. Where the logs cross at the corner they are halved and laid over each other. The seams are chinked with mortar. The foundation was built of local fieldstone from the surrounding grounds. The second floor was clad in cypress shakes which are resistant to rot. Almost all of the shakes on the house are original. The roof is covered in terracotta tiles, which was an afterthought. Originally Stickley's plan called for the roof to be covered with a black synthetic material called "Ruberoid." After a few years, it was changed to the green three-and-a-half pound terracotta roof tiles produced by the Chicago-based Ludowici Company, which is still operating today and provided replacement tiles for the house during renovations in the 1990s. Diamond-paned casement sash windows are used throughout the house. Though inspired by nature, Stickley incorporated the latest technology in his home, including electricity, indoor plumbing, a large icebox in the kitchen, and a machine for washing dishes. Copper fireplace hood at Craftsman Farms: "A world of strife shut out, a world of love shut in." The house contains three massive chimney stacks from which five fireboxes provided heat to the home. The fireplaces have low-hanging copper hoods with the following Craftsman mottos inscribed on them; "By hammer and hand do all things stand," "The lyf so short, the craft so long to lerne," "Sweet is the homecoming at eventide when we welcome glows from hearth and heart," "A world of strife shut out, a world of love shut in," and "The dear old farm with pictures of berries and fruit on the walls and nary a one on the table at all." By 1913, Stickley's growing business began operating out of a twelve-story building on 39th Street in Manhattan - the Craftsman Building. The building was Stickley's base for retail operations. It contained four floors of home furnishings and interior decorations, a permanent homebuilders' exposition spanning four floors, magazine and corporate offices, a library and lecture hall. The twelfth floor was topped with a restaurant called 'The Craftsman Restaurant'. The restaurant was an experiment in pure food, sanitation, and "progressive living." Eggs, dairy products, vegetables, and spring water was trucked in daily from Craftsman Farms. The restaurant opened in May 1913 and was out of business a few months short of three years later when the entire retail business failed. By March 1915, Stickley owed almost a quarter of a million dollars. He was forced to declare bankruptcy in New York and papers filed indicate a second mortgage of $50,000 on twenty-four New Jersey properties. In 1916, his magazine ceased publication, by August 1916 the entire stock of the Craftsman Workshops store was sold at Gimbels Department Store at reductions of 35% to 50%. His bankruptcy forced him to sell Craftsman Farms for approximately $100,000, about half of what he expected, to Major George and Sylvia Wurlitzer Farny in August 1917. The Craftsman Building, New York City. After selling the farm, Stickley moved back to Syracuse, where his wife was paralyzed by a stroke and died in 1919. He moved in with his daughter Barbara and her husband, who lived in the home he had built for his family in Syracuse in 1900. There he lived until his death on April 21, 1942. After purchasing the property, Farny added onto Stickley's log cabin. An annex was constructed for the family's servants in 1917. The annex was originally a large outdoor pergola off of the kitchen. It was constructed in a manner that closely mimics the Craftsman style, using fieldstones, wood shingles, and diamond paned casement windows. Today, the annex serves as space for education programs. For about ten years, Farny actively farmed and operated a dairy for the Morristown market. By the late 1920s, Farny rented his land to other farmers and in the 1930s converted several of the original Craftsman Farms buildings into residential units. George Farny passed away in 1941. Today, All the original Stickley-built buildings remain intact except for the cow stable which burned in the 1970s. When the property was threatened with development in January 1987 for fifty-two townhouses, the Township of Parsippany-Troy Hills, with the encouragement of community groups and others interested in the importance of the site, obtained the property through eminent domain in 1989. Craftsman Farms was placed on the National Register of Historic Places in 1989 and was granted National Historic Landmark status in 1990. Since 1991, the building has undergone numerous phases of restoration to return this property to its former glory. Just as Stickley placed Als Ik Kan on his pieces, the countless volunteers carry out his goal of providing a facility to teach others about the arts and crafts of a bygone era in a setting that marries nature with architecture on over thirty preserved acres in northern New Jersey.